Records were purchased by Stephen Lunsford, likely from Hoffer`s estate, and in turn sold to Simon Fraser University Special Collections and Rare Books in March 2006 and Winter 2008. 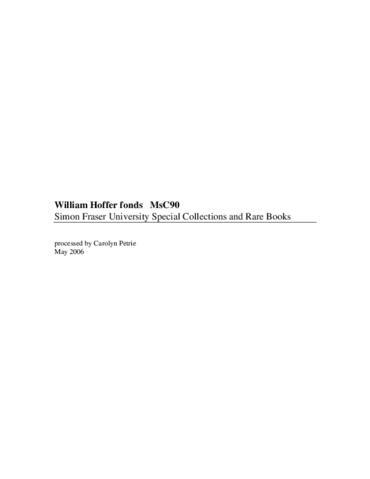 Fonds consists of records reflecting Hoffer`s bookselling and publishing activities during the 1980s. Records include correspondence, fiscal files, client files, journals, book catalogues, galleys, proofsheets, critical pieces, articles, and review. The fonds is composed of the following series: Series 1. Correspondence, Series 2. Publication files, Series 3. Business files, Series 4, Miscellaneous.